DAY 01 | WELCOME TO HUILO HUILO! Here is where your journey begins, in the Biological Reserve of Northern Patagonia. After arrival to the airport, a transfer will be waiting to take you to your hotel. Enjoy this first day to have a rest in your room with a magnificent view to the heart of the rainforest, wind down from your travel with a spa treatment, or visit one of the reserve’s self-guided trails. Nothofagus Hotel & Spa: In the midst of the temperate rainforest, as if it had come from some unknown kingdom, a tree extends its branches towards the sky and Nothofagus emerges. A magnificent building constructed with noble materials where sensations, shapes, textures and sounds can be experienced that will bring us back to the simplicity of nature. 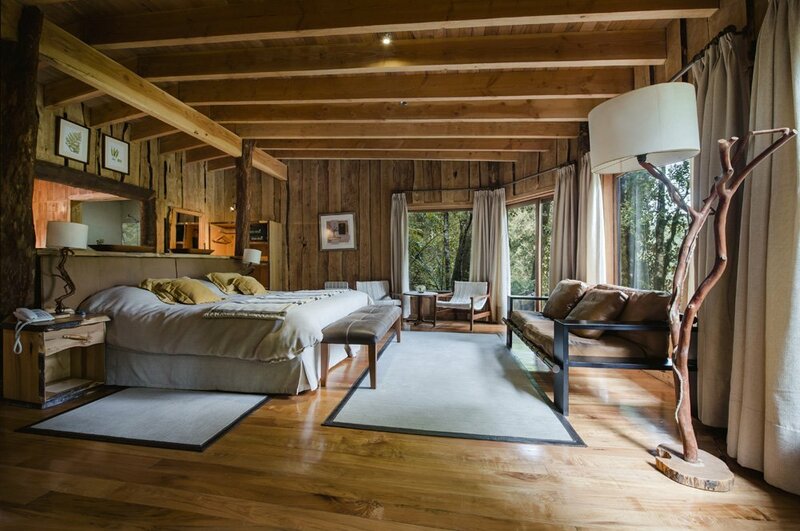 Nothufagus is the true heart of the Huilo Huilo Biological Reserve’s architectural complex. The majority of the activities that lead to unforgettable experiences begin from here. Welcome to Nothofagus and its innumerable corners of magic and beauty! After breakfast, you’ll be driven to the northern part the Reserve, at the departure point of Andean Lakes Trail. Enjoy the beautiful landscapes when you arrive to the trail, taking in vistas of dense forests, deep rivers and shimmering volcano lakes. Dine on your boxed lunch in the middle of nature. Continue your journey until you reach a mountain bike waiting just for you. Descend along a country road in the woods (6km/4mi) keeping your eyes out for wildlife and different styles of flora. At the end of the trail, a 4×4 vehicle will be waiting to take you back to the hotel. Eat a hearty breakfast in preparation for an adrenaline-packed third day! Get ready to paddle on the turquoise rapids of Fuy, not only a wonderful class III-IV river, but also one of the best rafting rivers in Chile. Descending through a beautiful valley of native forest, this activity will take approximately one hour and ten minutes. The second part of the day will take you to unmissable viewpoints up in the trees with a Canopy XL tour, reaching 90m above the ground and boasting 500m of zip lines. In the evening, why not relax at the Lawenko Spa, or sip on a tasty beer at the resort’s very own brewery Petermann? After breakfast this morning, say goodbye to the rainforest before your transfer to Puerto Montt to catch a flight to southern Patagonia. Welcome to Punta Arenas, a city full of history! Don’t miss the chance to stroll around downtown, visit the square and kiss the “Native’s foot” to be sure you will return to this part of the world! a small town on the shores of “Seno de Ultima Esperanza” fjord, where you’ll stop for lunch. were discovered in the 1890’s. Toward the end of your journey, the scenery will change to feature impressive landscapes and wildlife. After a full day’s journey through the beautiful countryside, you will reach Eco Camp Patagonia, world’s very first geodesic dome and voted by Travel & Leisure as one of the best hotels in the world, nestled in the heart of Torres del Paine National Park. Rest well tonight, the next days are brimming with adventure! Eco Camp Patagonia: Come and immerse yourself in the stunning world of Torres del Paine National Park. Located in the heart of it all is the world’s first dome hotel, EcoCamp Patagonia, which is modeled on the ancient shelters of the region’s Kaweskar people. Spend your days exploring this fragile paradise with trekking, multi-sport adventures, and wildlife watching, and your nights in harmony with nature in your very own dome. Best of all, we are 100% sustainable meaning that you can relax and enjoy your trip without worrying about your impact on this fragile land. 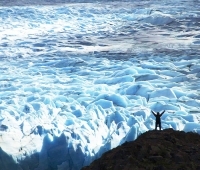 The end of the world awaits - transform yourself at EcoCamp Patagonia. 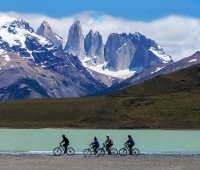 Your tour begins after a hearty Chilean breakfast with a car ride to Estancia Laguna Amarga, where mountain bikes are waiting for your small group excursion. Pedal towards the Laguna Azul campsite, encountering the fauna of Patagonian plains like guanacos and ostrich-like ñandús, and even maybe a puma if you’re lucky. Head north to reach the Paine waterfall and its stunning views. Continue your journey past a small canyon in the middle of the Patagonian wilderness before continuing on towards Laguna Azul. Enjoy a boxed lunch upon arrival at Laguna Azul. After some rest, enjoy some time to explore the surroundings and climb to a nearby sightseeing point with a panoramic view of the lagoon and the Torres in the distance. The cycle ride back is optional – anyone who is tired after the journey is welcome to travel back in the support van (accompanying the group at all times on the outward journey). Back at EcoCamp, cyclists reunite with their Safari hiking counterparts to enjoy an evening aperitif. After breakfast at EcoCamp, head off at 9am to Grey Lake in the western sector of the park, about a two hour drive away. Cross the glacier lake in a boat, enjoying views of the Paine massif and the impressive glacier which forms part of the Southern Patagonian Ice Field. Disemabark near the glacier to spend the day kayaking on the Grey Lake! 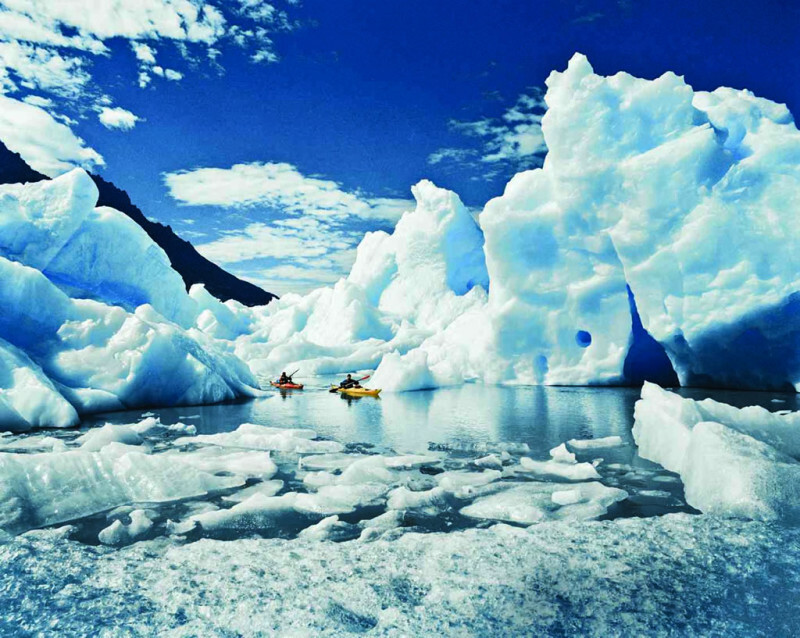 (All Equipment & Safety Briefing Included) Paddle out into the lake and head towards the eastern face of the glacier! Navigate between gigantic floating icebergs to come nearly face-to-face with the mighty wall of the glacier itself. Your guide will offer you a snack and hot drink to replenish your energy, while admiring the immensity of the iceberg and its myriad shades of blue. Return to the van that will take you back to your lodging by boat. Savor an evening aperitif and meal upon arrival. One of the best ways to enjoy all that Patagonia has to offer is by riding through it on horseback. This excursion departs at 9:30am, after your hearty breakfast at EcoCamp. Admire the most spectacular parts of Paine Hill with a full day of horseback riding. Venture through forests and cross streams with your companion, all the while surrounded by amazing greenery. There are 5 different prairies along this trip and experienced riders are welcome to gallop through these parts at their leisure. If you visit in February, you will be able see the Encantado valley. Lunch will be served at the Seron campsite which boasts a spectacular view that features parts of las Torres, Mount Admiral Nieto, the Blue lagoon and the Paine river. Options to continue riding past 4:00pm or head back early to EcoCamp to enjoy an evening cocktail are available to the group. If you are a horseback riding fanatic this is the perfect adventure for you! If this excursion is cancelled because of climate conditions, it will be replaced by the trek to French Valley. After breakfast, there will be a group walk from the campsite towards Hostería Las Torres before ascending to Ascencio Valley on the Tower’s eastern face. Mountain ridges, beech forests and small rivers line the scenic walk towards the valley. The big challenge comes in the form of the steep moraine, a huge mass of boulders that lead to the iconic base-view of the Towers – Three gigantic granite monoliths, the remains of a great cirque sheared away by the forces of glacial ice. After a tough uphill climb, the Towers eventually come into full majestic view, with the glacial lake visible below. Is there any better place in the world to have lunch? After feasting on the view and a picnic, backtrack along the same trail through Ascencio Valley and return to EcoCamp for a well-deserved dinner. After breakfast and checkout, it’s time to say goodbye to Chile. Your transfer will be ready to take you to the airport for your departure flight home.